Today I want to talk about one of the most important Excel functions – INDIRECT function. Before doing that, I need to give you a brief introduction on dollar sign ($) in Excel formula. You can’t understand INDIRECT function very well without a good knowledge of dollar sign ($). You can skip to next part if you are already familiar with the dollar sign ($). I’d like to explain it using an example. Suppose you have a simple formula “=A1” in cell B1. This formula will change as “=A2” when you copy and paste it into cell B2. If you paste it into cell C1, the formula will be “=B1”. And it will be “=B2” for cell C2. Did you notice that both the column reference and row reference can change? It is useful and allows a formula like SUM to be copied across or down the page and automatically refer to the new column or row. But in some situations, you want some or all of the references to remain fixed when they are copied elsewhere and this is where the dollar sign ($) can be used. The dollar sign ($) can precede the column reference, the row reference, or both. “A$1” means the row reference does not change when copied. “$A1” implies that column reference does not change while “$A$1” tells that both the column reference and row reference do not change when copied. Here is a summary of what you will get if we change the above example a little bit. You can make a complicated formula and copy it elsewhere to see what will happen. It will help you better grasp relative reference and absolute reference. Master Excel Formulas & Functions in Just 3.5 Hours! with my FREE COURSE at Udemy. Excel Formulas and Functions with Excel Formulas Cheat Sheet! Now it’s time for us to discuss INDIRECT function. Knowing how to use it will enable you to solve many seemingly unsolvable problems, though mastering it is a little bit difficult for a newbie. In essence, it returns the references specified by a text string and the returned references can be immediately evaluated to display their content. With INDIRECT function, you can change the reference to a cell within a formula without changing the formula itself. Below example can give you a better understanding of it. The left section shows sample data and the right section applied the INDIRECT function to retrieve data from the left section. I put formulas “=INDIRECT(A2) in cell D2, then copy and paste this formula down up to column D.
In order to give you a good explanation, I also put formulas as a text string for all cells (Cell D2, D3, D4 & D5) in column E.
You can see that the content of cell A3 is “B4”, but the returned value is “2” instead of “B4” when I enter formula “=INDIRECT(A3)” in cell D3. Because “B4” is a reference and Excel evaluated this reference and returns the content in cell B4 (see cells with blue borders). 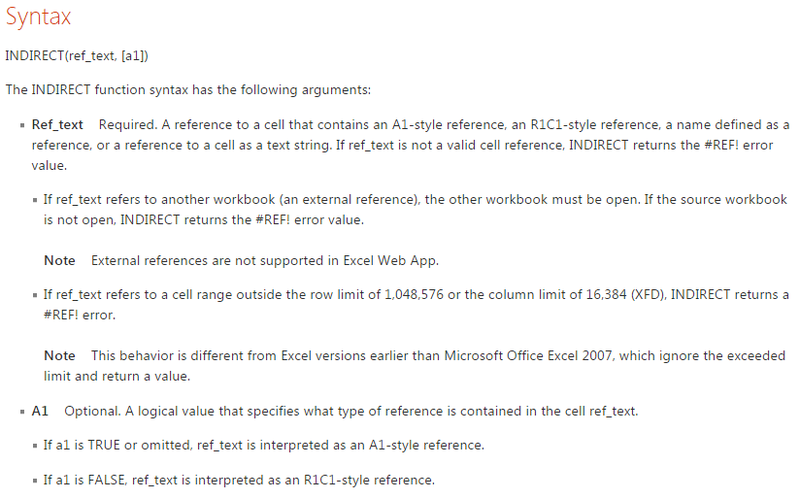 Please note that if the reference is not valid, Excel will return “#REF!” error, just like what we get for cells D4 and D5. Obviously, “New York” and “6” are not valid references. As for the reference, we all know that ADDRESS function can yield the actual cell address associated with a row and column. Then is it possible to use INDIRECT function together with ADDRESS function? What will you get? Let’s take ADDRESS (2,1) as an example, Excel ADDRESS function will return “$A$2”. In cell D6, entering formula “=INDIRECT (ADDRESS (2,1))”, I get “B2” which is the content of cell A2. The INDIRECT does not evaluate reference “B2”. Interesting? You can compare this formula together with formula in cell D2 to have a better understanding. With above knowledge, I will give you examples showing how to solve problems in real life. Suppose that we have data for the sales of 7 products in four regions (East, West, North, and South). How can you use the INDIRECT function to calculate the total sales of any combination of consecutively numbered products, such as Product 1 through Product 4, Product 3 through Product 5, and so on? Usually, we will use formula “=SUM(D6:D9)” to compute total sale of Product 1 through Product 4 in East and “=Sum(D8:D10)” to compute total sale of Product 1 through Product 4 in East. You can see that we need to modify formula every time we want to see total sales of different products in one region. Obviously changing formula is time-consuming if there are many regions. Luckily, we have another approach with INDIRECT function. Look at the cell D15 in above figure, the formula is “=SUM(INDIRECT(D$14&$D$2&”:”&D$14&$D$3))”. Every cell reference within the INDIRECT part of this formula is evaluated to equal the contents of the cell. D$14 is evaluated as D, $D$2 is evaluated as 6, and $D$3 is evaluated as 9. With the ampersand (&) included as the concatenation symbol, Excel evaluates this formula as “SUM(D6:D9)”, which is exactly what we want. From the right section, you can see that by changing values in Cells D2 and D3, the formula in D15 is evaluated by Excel to be “SUM(D8:D10)” which is also what want. Thus, by placing the starting and ending rows of the summation in cells D2 and D3 and using the INDIRECT function, all we need to do is to change the starting and ending row reference in D2 and D3 when we want to compute sales for a different combination of products. The last point that needs your attention in figure 2 is the difference and similarities between two formulas. The formula in cell E15 is just copied from cell D15. By copying and pasting, you don’t need to do manual work. But you have to make sure that what you get is right. That’s the reason why I mention dollar sign ($) at the beginning. Suppose you have a workbook contains each employee’s hours of work and employee rating for January-May and you want to set up a master sheet that enables you to report all employee’s working hours or all employee’s overall rating for all months. Since a figure can only include limited information. I only created a sample workbook with two source worksheets and one master worksheet (see below in Figure 3). By only changing values in cell D2 in the master worksheet, you can see from the figure that we can choose to report all employee’s working hours or their overall rating. And the Excel will list the name of the report in cell B2. I entered formula “=INDIRECT(C$4&”!”&$D$2&$A5)” in cell C5, then copied and pasted into other cells in range C5:D11. “C$4” will be evaluated as “Lucy”. By concatenating with “!”, we got the spreadsheet name “Lucy!”. “$D$2” was evaluated as “C” and “$A5” was evaluated as 3. Altogether, the final reference evaluated by Excel is “Lucy!C3” and you can see from the lower left part of below figure that the content is 40. And 40 is just what we want. Since I did not place a dollar sign ($) between “$A” and “5” in above formula, the formula will change to be “=INDIRECT(C$4&”!”&$D$2&$A6)” when it was copied into cell C6. This is very important. Otherwise, you will 40 instead of 39. Obviously, 40 is not what we want. Therefore, please remind that you should be very careful about dollar sign ($). Let’s move on to the next formula – “=INDIRECT($C$4&”!”&$D$2&“2”)” (upper left part of Figure 3). Again, C$4&”!”&$D$2 will be evaluated as “Lucy!C” and by concatenating with 2, we get “Lucy!C2” and the content in that cell is “Hours”. 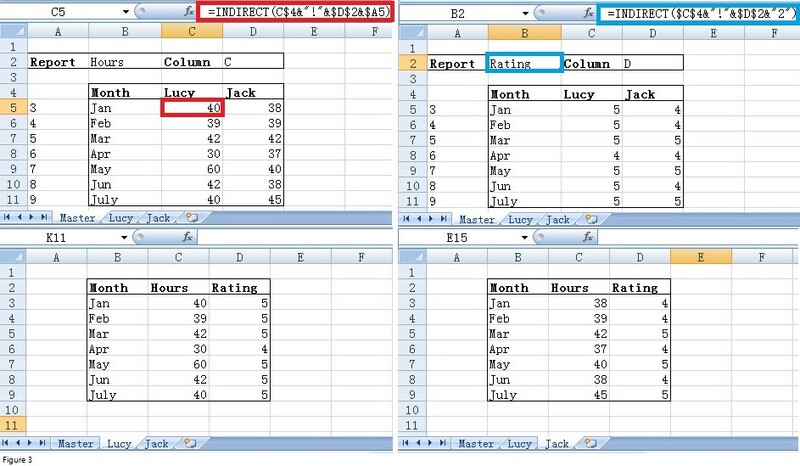 Since the second row is the same for all source worksheets – Lucy and Jack in our case, I decided to retrieve data only from the second spreadsheet and I placed a dollar sign (in red) before “C”. You can compare the two formulas to see the differences and similarities. With this workbook, you can add any number of rows into each source worksheet and any number of source worksheets. As long as you fill the name of added worksheet in the 4th row and put reference number in column A, the master worksheet will give you all final complete report. Sometimes we need to transpose vertical data into horizontal data, just as shown in Figure 4. And in this kind of situation, VLOOKUP function is often used. It is well known that the second argument for VLOOKUP function should be cell range that is to be searched for the first argument. Then how can we combine VLOOKUP function with INDIRECT function? From below figure, we can see that formula in cell F2 is “=VLOOKUP (F$2, INDIRECT($E3),2,FALSE)”. The content of “$E3” is “Company1” and this is absolutely not a valid reference per our introduction at the beginning. Then why Excel did not give “#ref!”? There must be something special. Therefore before entering the formula, we need to give all three ranges (B3:C5, B8:C10 and B13:C15) a name as “Company1”, “Company2” and “Company3”, respectively. To name a range can be done by following below steps: Select the range of cells that contain the data we want to give a name; Right-click with the select range and click Name a Range or Define Name; Type the name for the range in the New Name dialog box; Click Ok. This approach can also be used to search range from different worksheets then put the retrieved data in a master worksheet. You can figure out how to do this based on case 2 and case 3 in this post. This is a good exercise for you to test if have the master INDIRECT function or not. The Named Ranges in Case 3 should be B3:C5, B8:C10 and B13:C15. Hi Jack. Thanks for pointing it out. I did not realize that I made a typo mistake.